Collections by Weiser offers five handlesets to choose from. These handlesets offer solid forged brass construction and Grade 1 cylinders for uncompromised security. Exuding a sense of timeless beauty, the oval shape and sophisticated lines of the Brixton knob make a lasting impression. This passage knob/lever is best used in interior hall and closet applications where no locking is required. The knob/lever is reversible and mounts on both left and right handed doors. The crisp, clean appearance of the Satin Nickel finish adds to the overall look of the product and brings a modern feel. Fits door thickness of 1-3/8" to 1-3/4"
Featuring a Lifetime Guarantee, DEFIANT<sup></sup> meets or exceeds ANSI Grade 3 Standards for residential use. This lock features a drive in latch with an adjustable backset and optional radius cut faceplate . The Powder coated finish will provide years of durability. When used as a replacement lock only a screwdriver is need to make installation a snap. The Welcome Home Series<sup></sup> of Fashion Doorware was designed to make your life more comfortable and carefree. From classic to contemporary, ornate to refined, the Welcome Home Series<sup></sup> offers a wide selection of styles to create that custom look. Fashion Doorware from Weiser can make your life stylish and more secure. Welcome Home! Baldwin has a 60 year legacy of craftsmanship and innovation. Rated #1 in quality by builders and contractors, Baldwin is pleased to offer a line of luxury hardware for the discriminating consumer, our Prestige Series. Feel the difference - Baldwin hardware is solid throughout. With a 60 year legacy of superior style and quality, Baldwin is the choice for an elegant and secure presence. Exuding a sense of timeless beauty, the oval shape and sophisticated lines of the Carnaby knob make a lasting impression. The crisp, clean appearance of the Satin nickel finish adds to the overall look of the product and brings a modern feel. Both knobs/levers can be locked or unlocked by key on the outside, or turn button on the inside. SmartKey Re-key Technology allows you to control who has access to your home. Re-key the lock yourself in seconds in 3 easy steps. Have you recently moved or had a child lose a key. Its time to re-key. SmartKey provides the highest level of residential security and features BumpGuard to protect against lock bumping. Welcome Home Series<sup></sup> handlesets are the perfect addition to your front door to create a unique and fashionable entryway to your home. Each is stylishly designed to provide maximum-security protection. There are many styles, finishes and configurations from which to choose. Exquisite design combined with a distinctive profile, the Troy knob executes strength and beauty This passage knob/lever is best used in interior hall and closet applications where no locking is required. The knob/lever is reversible and mounts on both left and right handed doors. The Antique Nickel finish offers a warm feel to the products style. 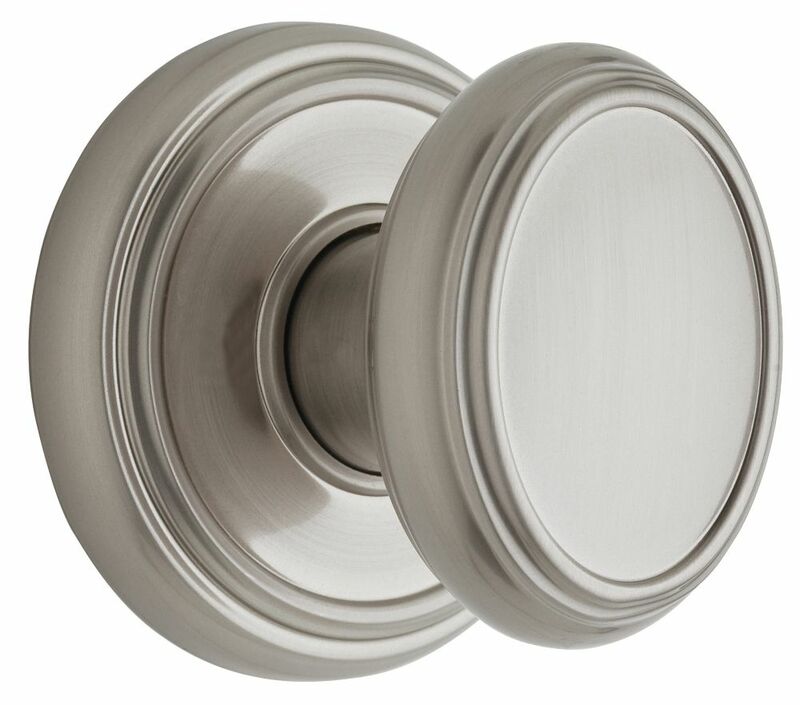 Brixton Satin Nickel Passage Knob Collections by Weiser offers five handlesets to choose from. These handlesets offer solid forged brass construction and Grade 1 cylinders for uncompromised security. Exuding a sense of timeless beauty, the oval shape and sophisticated lines of the Brixton knob make a lasting impression. This passage knob/lever is best used in interior hall and closet applications where no locking is required. The knob/lever is reversible and mounts on both left and right handed doors. The crisp, clean appearance of the Satin Nickel finish adds to the overall look of the product and brings a modern feel.